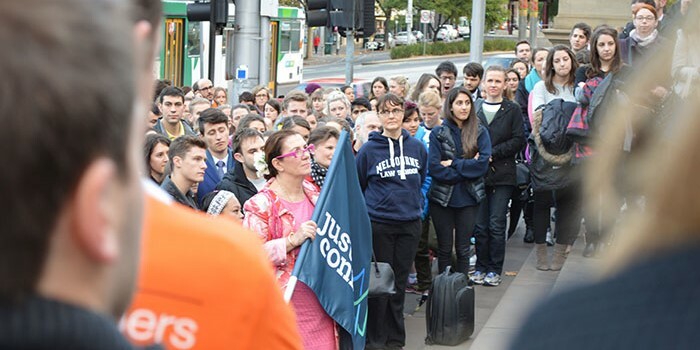 The impassioned group walked from the steps of Parliament House on Spring Street to the County Court on William Street as part of Justice Connect's annual Walk for Justice. Simultaneous walks took place in Sydney and Newcastle. Dean of Melbourne Law School Professor Carolyn Evans joined MLS staff and students as Patron for the walk, alongside Attorney General Martin Pakula and the Hon Justice Chris Maxwell. "Improving access to justice is an important aspect of creating a fair and equal society," Professor Evans said. "Services such as Legal Aid are imperative for ordinary people struggling to find affordable legal advice so it was pleasing to represent Melbourne Law School alongside many of our students and alumni in showing our respect and dedication to this essential cause." Today's walk comes just a month after the release of a new report on civil legal services for Victorian prisoners revealed 70 per cent had experienced homelessness, 40 per cent had mental health issues and 33 per cent had a physical disability. The Justice Connect Homeless Law report shows the findings of an outreach legal clinic at Port Phillip Prison, which provided 38 prisoners with pro bono legal advice and representation by lawyers from Corrs Chambers Westgarth. More than half of the initial 120 clients were worried their financial issues would limit their ability to obtain housing upon their release, with the outreach project working to reduce the rate of homelessness for released prisoners. For this morning's Walk for Justice, Melbourne Law School was awarded chief fundraiser among Victorian law schools, alongside DLA Piper in the legal profession. The walk is just one of a number of events to be held throughout Law Week, which runs until May 17. Visit Justice Connect's website for more information.